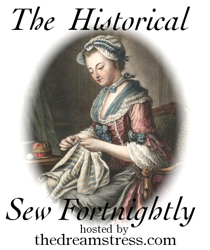 My last stop on my Regency Journey is to look at women’s hairstyles in Regency times. Unfortunately my first attempts at practising Regency hairstyles before the event were abysmal and I gave up! 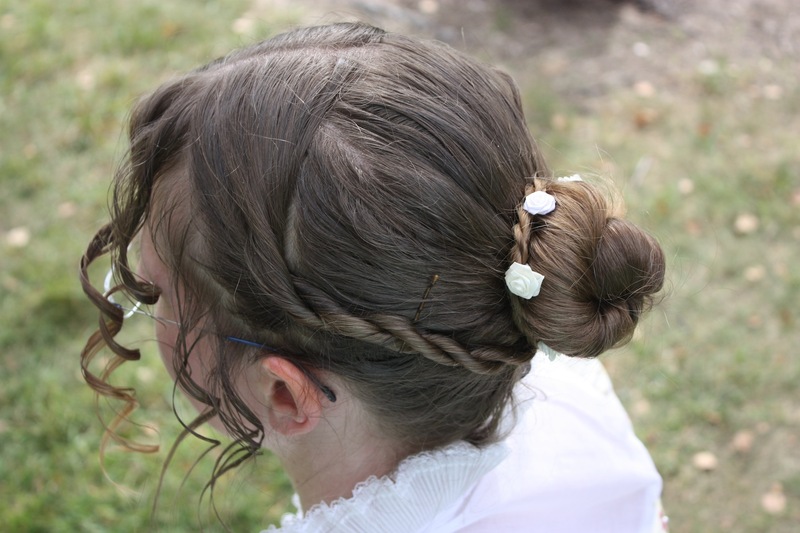 I discovered when I arrived at the Jane Austen Festival that the trick (for my hair at least) was to use lots of hair mousse and hairspray to prevent my bun from unravelling. So, instead of posting a hair tutorial, I have just post the finished pictures of my hair for each day of the festival, with some basic instructions for doing it. There are also links below that I found useful in developing my ideas and showing me how-to tips. Day One of the Festival comprised of travelling and then a movie night, so I did not do my hair for this day. Day Two: The back 3/4 of hair is a ponytail twisted into a bun. 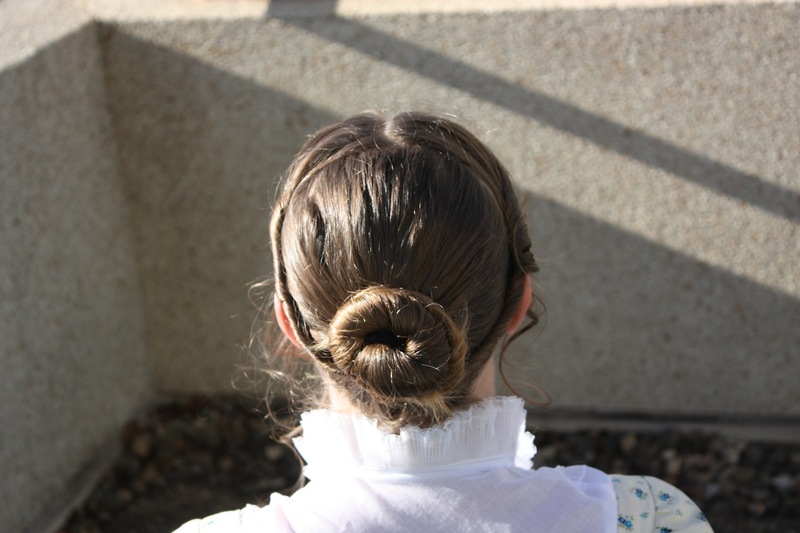 The front 1/4 is parted in two and each side is twisted and then pulled to the back and wound around the bottom of the bun. There are some strands at the front curled with a curling iron. Day Two: As before, the back is a pony tail twisted into a bun, and the front is parted in two and plaited. The plaits are then each pulled back to the bun and twisted around it. Front strands of hair are curled. Day Two - The Ball: Once again the back portion of hair is tied in a ponytail. This time, I separated a portion of the ponytail and then twisted the rest into a bun. The left over portion was curled and pinned to hang next to the bun. I put a diamonte comb next to the bun too. For the front section, I positioned a string of pearls like a headband, then pulled it to the back and twisted it up around the base of the bun. The front part of the hair was parted in two, twisted and pulled around the bun in the same way as for Day Two. The front strands were curled. Day Four: The back was again put in a ponytail and twisted into a bun. The front section was parted in the middle. Then each side was divided in two and twisted the same direction. Then the two were put together and twisted in the opposite direction to form a rope plait. This was pulled to the back and twisted around the bun. Small fake flowers were poked into the bun to decorate. The front strands were again curled. Essentially I followed the same sort of structure for my hair across all the festival days, with a back ponytail and then front sections parted and twisted back around the bun. This was partially because the weekend was jammed packed with other events, and I had little time to spare for trialling different styles. My sister's hair: The hair was first divided in half, with the back half put in a ponytail and twisted into a bun. Then the remaining hair was divided in half again. 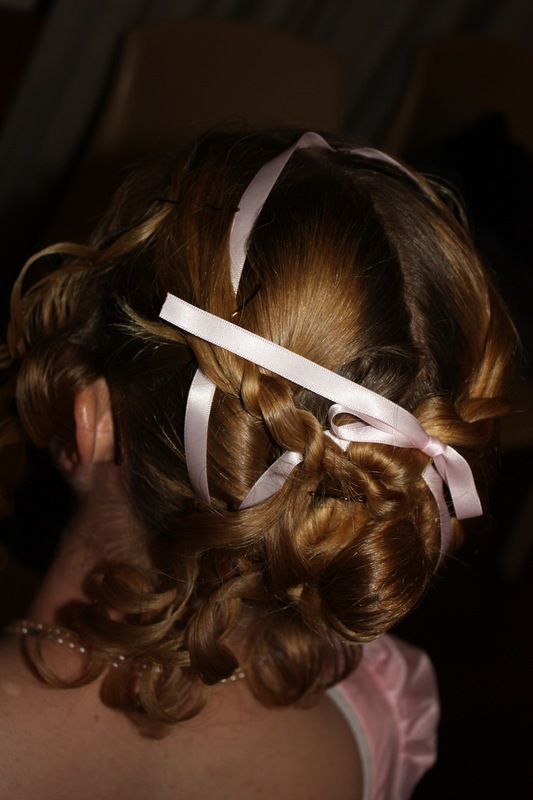 For the middle section of hair (above the bun but below the front sections), the hair was parted in two (with a small section directly above the bun left free to curl later). 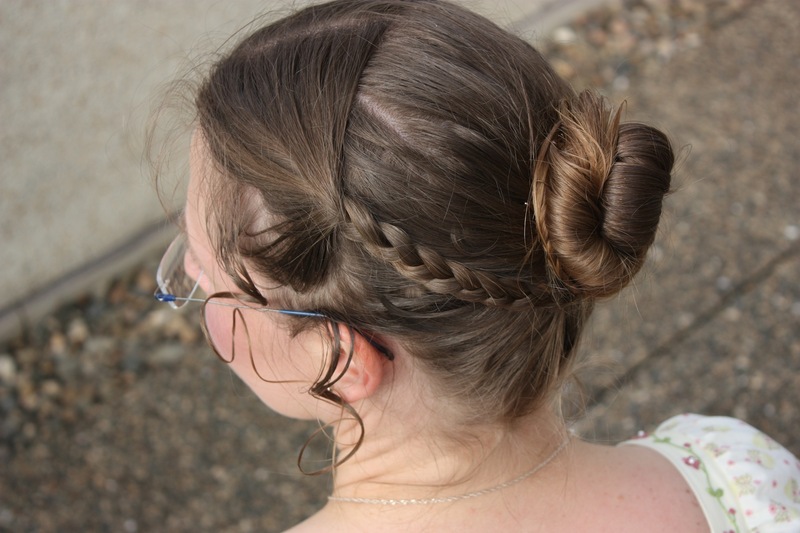 The two sides of the middle section were twisted and pulled back around the bun. For the front section, I used a ribbon as a headband and wound it back around the bun (as I had done with my pearls above). Then front hair was parted in two and each side twisted. The twists were pulled straight towards the bun and then turned back on themselves to form a rope. This was then pinned in place above the bun. The best bit about my hair was that it coped with a full day and night of dancing each day without falling out! I got all these ideas from the links below, so check them out if you want further tips. My next post will be all about the festival itself – coming soon! 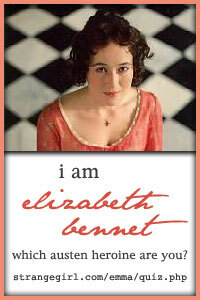 Check out all my Regency posts in order, at My Regency Journey. 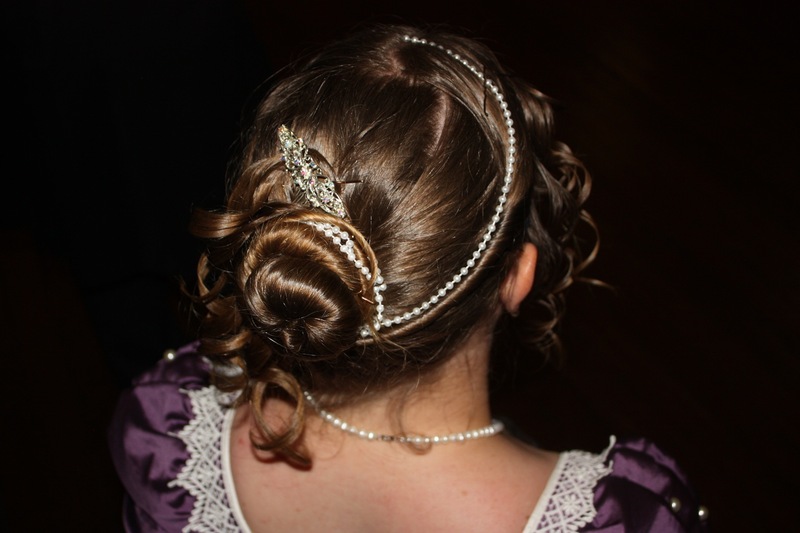 Regency Hairstyles and their Accessories – by Jane Austen’s World. This blog has a compilation of fashion pictures from the era that help give you a sense of the range of hairstyles used. There is also some great information about hair accessories. Rapunzel’s Resource – Emma Woodhouse hairstyles – this blog has many different hairstyles and tutorials for longer hair, including instructions for how to do rope plaits/braids (which I thought were cool!). This particular link will take you to a week of tutorials based on Gwyneth Paltrow’s styles in the movie, “Emma”. Locks of Elegance – Regency Hairstyling Tutorials – these Regency hairstyles are nice and simple to achieve, yet look very pretty. Most of my hairstyles were based on these. I love your Tea in a Teacup! I am going to my first English Country Dance when I will be dressed appropriately, but HAIR!! I tried clicking on your hair links, but received the message to get permission by contacting the Blogger for an invitation. Can you help me? I just tried accessing Locks of Elegance and she must have closed her site. I know that she had stopped blogging a few years ago. You might be able to find some of her pictures on Pinterest that people may have saved before her site closed down. She had some lovely hairstyles, but they were very basic and easy to achieve. In essence, she divided her hair into thirds. The back two thirds she put into a bun. The front third she parted in half at the front and either twisted or plaited it and pulled it back to be wound around the bun. Both of these styles I have tried in this post. I’m sure you will get plenty of other ideas online too!